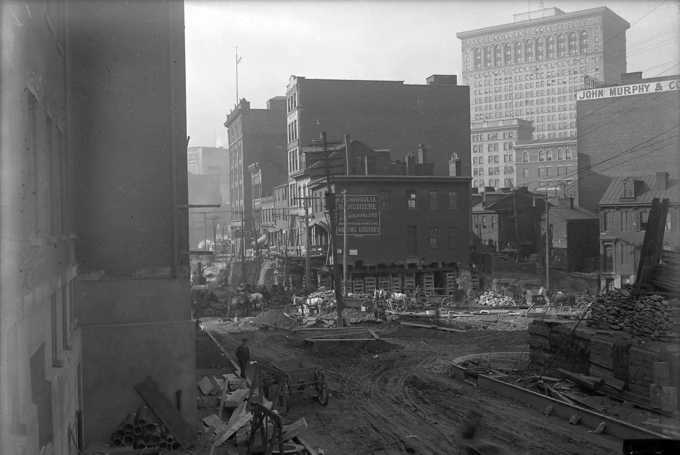 View of construction on Webster Avenue looking west, showing the corner of Tunnel Street. Streets--Pennsylvania--Pittsburgh--Maintenance and repair. ; Commercial buildings--Pennsylvania--Pittsburgh. ; Blue collar workers--Pennsylvania--Pittsburgh. ; Horse-drawn vehicles--Pennsylvania--Pittsburgh. ; Chatham Street (Pittsburgh, Pa.). ; Webster Avenue (Pittsburgh, Pa.). ; Downtown (Pittsburgh, Pa.). Tunnel Street was an alley where the USX courtyard now stands. The tall building in the background is the still standing Oliver Building on Smithfield Street. Tunnel was much more than an alley. It had a lot of traffic from 5th, thru Wylie, to Webster near where cars could get on Bigelow outbound. It's true that Tunnel ended 'near' where the USS bldg is now. Look at this old map - https://historicpittsburgh.org/isla... - From 5th Ave, going north, parallel streets were 6th Ave, Tunnel, Chatham, Fernando, Washington, and so on. I lived nearby as a kid. Never saw a map old enough of that street it seems, I was recalling a late 1960s one for the construction of the USX construction where there was but a small slither of it left. I stand corrected.